Kids will love this special birthday lunch. Don't forget to make a wish! 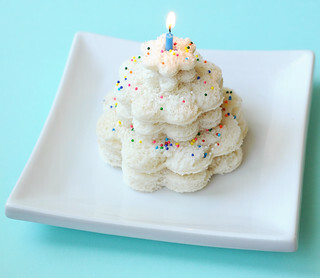 These birthday cake sandwiches were really simple to make. I put a candle in each of the sandwiches, we sang “Happy Birthday to You” and then the kids blew out the candles. Too fun! It was such a simple thing to do and it really made for a special day. 1. Using the four pieces of bread and peanut butter, make two peanut butter sandwiches. 2. Using the largest cookie cutter, cut one of the sandwiches into a flower shape. Place on your plate. 3. Using the other peanut butter sandwich, cut both a middle-sized flower and a small flower from the one sandwich. Layer these flowers on your plate. 4. Sprinkle some rainbow sprinkles over top of the sandwich. 6. Serve with a side of fruit and/or veggie for a complete lunch. This was a great and simple addition to my little girl’s birthday and she absolutely adored it. I think it will definitely be a tradition in our house for an awesome birthday lunch! Jill Dubien is a working mom who loves to craft and cook with her kiddos in her spare time. She has an awesome and supportive husband and 2 wonderful kids—a daughter who is 4 and a son who is 3. Before she had kids, Jill couldn’t cook much of anything except toast and cereal, and really despised being in the kitchen. People who know her personally find it extremely humorous that she is now the self-proclaimed “Queen of fun food.” Jill blogs at Meet the Dubiens, where she shares lots of fun foods and crafts for kids. Stopping over from your feature at Be Different Act Normal to pin that adorable sandwich!